Another rustic Christmas mantel done! 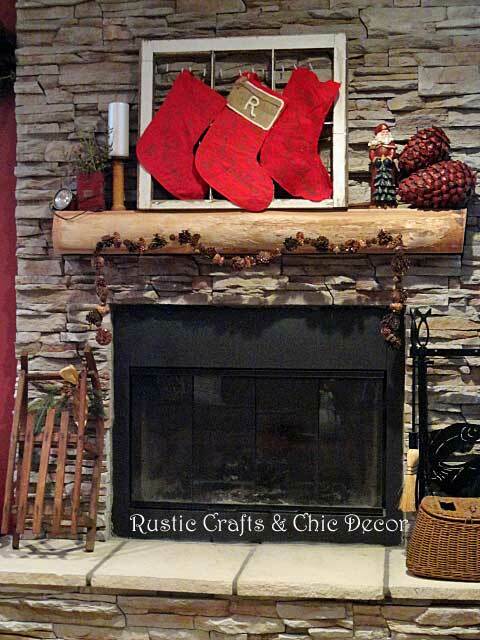 I love decorating our basement fireplace mantel because we have that area decorated in a rustic lodge theme. It is our cabin when we can’t get to our cabin! Every year I decorate it a little differently and this year I went a little more heavy on the vintage items. It all started with the vintage window frame that I had to use! 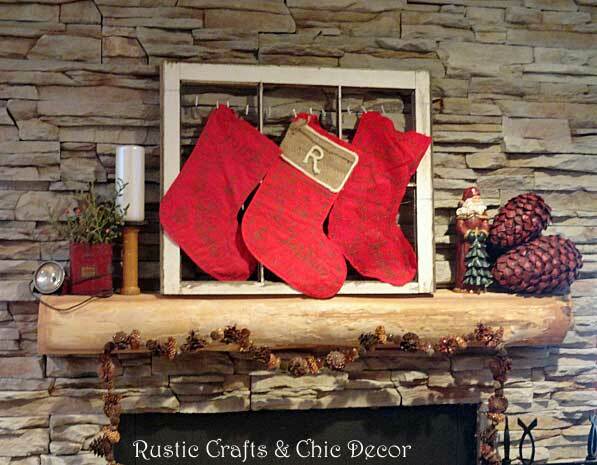 I love to hang our stockings from the mantel but we have a lot of real fires in the fireplace…..meaning wood burning. When my husband would make fires, he would take down the stockings. I’m not sure if they were just in the way or he had a fear of them catching on fire. Either way, it didn’t look so cute and festive anymore with a pile of red heaped onto a chair or wherever. 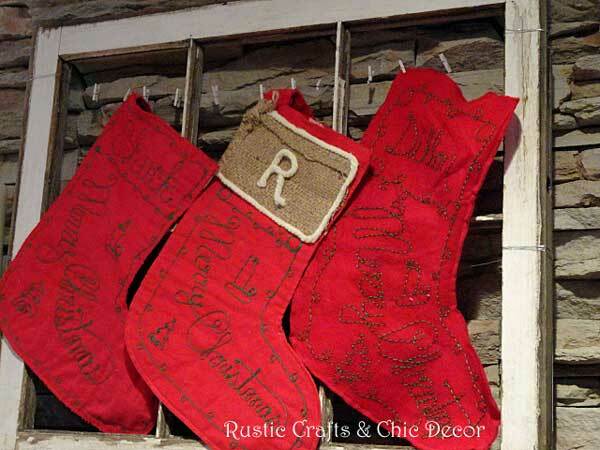 I used my window frame as a stocking holder! I just ran wire across the frame and used tiny clothespins to clip the red flannel stockings to the wire. Then, I just placed the frame on the mantel where there was no chance of sparks getting to it. To the left side of the frame, I decided to use a vintage wooden bobbin as a pillar candle holder. I also brought out my favorite vintage miners light filled with Christmas greenery. 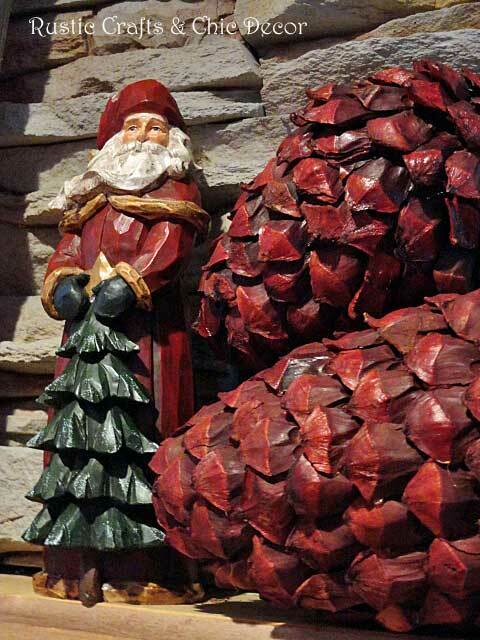 And, have you ever seen pine cones this big? They were manufactured of course but I would love to see a tree big enough to produce some that size! The big picture will give you a better idea of their size. I hung some pine cone garland from the face of the mantel since our mantel is so shallow. The wood is a rough finish so I could put in tiny nails to hold it in place. 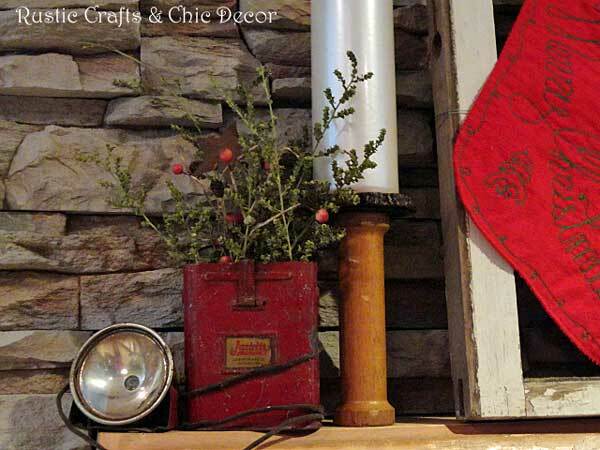 To finish the fireplace decorating, I added a small vintage sled to the hearth and called it good.